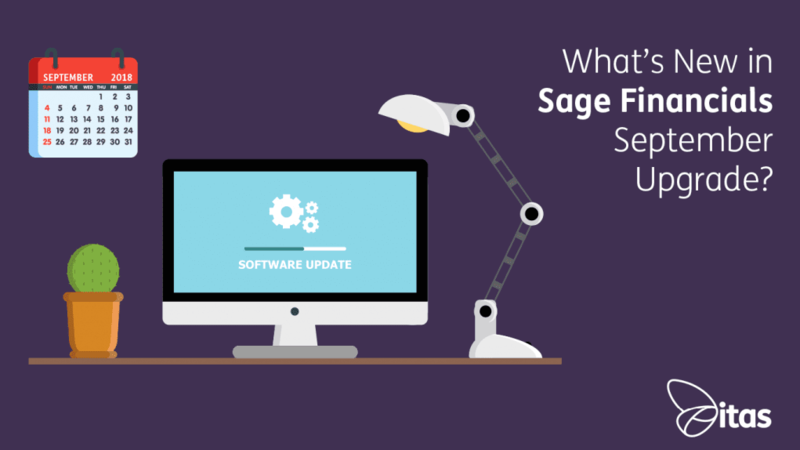 Sage Financials: What’s New in Sage Financials September Upgrade? Sage Financials: What’s New in Sage Financials September 2018 Upgrade? With summer officially drawing to a close, the latest Sage Financials upgrade is here! Septembers upgrade is a pull upgrade, allowing you the choice of when you want the upgrade applied to your org. If you would like this upgrade rolled to your org, reach out to your Support team who will be able to apply this for you after the 28th September 2018. Version 86 sees some new features, enhancements and fixes to help improve the overall usability of Sage Financials. Please be aware that there are some important factors to check over before installing this update, which we will cover below. Change Impacting Custom Reports – Action needed! Before the installation of this Sage Financials upgrade you need to check your custom reports. Any custom reports that use the Report Dimension Data report type or that contain dimension data will return errors. You will need to re-create your reports using the Ledger Items with Extended Dimensions report type to resolve the errors. To see what Report Types your reports are built on, head to your report and click edit. Then click Report Properties, here you will see which report type your report is built off of. If you require assistance with this, or editing your report – reach out to the support team and they can help point you in the right direction. This part of the upgrade is only applicable to users with US entities in Sage Financials. If that doesn’t apply to you, feel free to skip ahead! Sage Financials now has a real time and accurate integration with AvaTax. AvaTax from Avalara, is a third party integration used to calculate Sales and Use Taxes for businesses that trade in and around the United States of America. Continuously kept up-to-date, AvaTax ensures your business is complying with the complex Tax and Sales rules in operation in the US. The integration is seamless, using the Sage Financials API there is no need to import or export CSV files nor configure a feed. The integration allows you to validate addresses, synchronise tax codes, products, check the tax and send transactions to AvaTax; all from within Sage Financials. In order to use AvaTax, you will need to create an account with them. You can now view and set related tags applicable to a record type when creating a new Customer, Contributor or Supplier record. This should simplify the process when creating a new record and setting up the related tags like Payment Terms. Related Tags are visible within the Related tab, in the Customer/Contributor/Supplier record once they have been created. You now have the option to add a Primary Contact whilst creating a new Contributor, Supplier or Customer record. This Primary Contact will then receive invoices sent from the system. The Primary Contact is visible from your customer list or within the Financial Details tab whilst in the Customer record. This part of the upgrade is for UK and US Sage Financials users only. If that doesn’t apply to you, feel free to skip ahead! Previously, only new customers we’re eligible for the recent improvements made for Non-Profit Organisations however, the new upgrade will ensure existing users can now take advantage of these improvements too! Another exclusive for UK and US Sage Financials customers, transaction history can now be imported into Financials using the data import tool! When entering transactions, the date fields could not be cleared. Transactions requiring mandatory dimension tags could be saved incorrectly, an error was only generated when trying to post. The Rebuild Ledger Balances generated an error referencing manual adjustments and reversals. When cloning posting rules, the Business Type and Optional flag were not copied. In addition, the Template was incorrectly copied. Converting a purchase order with a stock item created a error. Allocating customer receipts did not update the customer’s balance on the Retrospective Aged Debt report. Transactions created from a large number of contracts could not be posted by the scheduled job. This generated an error. Negative values on the Ledger Account Statement were prefaced with an apostrophe. If you have anything that you think would be an improvement to Sage Financials, you can log these as an idea on the Sage Idea Hub. For more information on the Sage Idea’s Hub, check out last months Sage Financials Upgrade blog. If you have any questions about the latest Sage Financials Upgrade, get in touch with a member of our team. Home » Sage Blog » Sage Financials » Sage Financials: What’s New in Sage Financials September 2018 Upgrade?